Here’s how to counsel parents to ensure kids get the nutrients they need and the delicious meals they crave. Chances are your adult clients and patients don’t remember having classmates in elementary school who followed a gluten-free diet. That’s because at that time the diagnosis was rare. But as you know, times have changed dramatically. The incidence of celiac disease has quadrupled since the 1950s, and increased awareness during the past decade has led to more diagnoses and better management and treatment options.1 Research shows that one in 100 people in the United States have celiac disease. In addition, approximately 6% of the population has gluten sensitivity, or a nonceliac adverse reaction to eating gluten.2 These statistics include a significant number of children who need to eat a strict gluten-free diet but still get the necessary nutrients for proper growth and development. When counseling adult clients, it’s best to tell them what celiac disease is in simple terms. Celiac disease is an autoimmune condition in which the body attacks its own tissues in response to gluten, a protein found in wheat, barley, rye, and most oats. When people with celiac disease consume gluten, the immune system responds by damaging the fingerlike villi of the brush border in the small intestine, which results in malabsorption of vital nutrients and profound nutrient deficiencies. Classic celiac disease symptoms include stomach pain, diarrhea, constipation, and weight loss, but many people have atypical symptoms, such as fatigue, neurologic problems, or joint pain. Some people exhibit no symptoms. In children, typical symptoms include slow growth, short stature, anemia, or delayed puberty. But like adults’, children’s symptoms can vary considerably. Because celiac is a condition of malabsorption, physicians should test newly diagnosed children for deficiencies in iron, vitamins B12 and D, and folate. Test results provide valuable information to begin nutrition counseling. Deficiencies in B vitamins and calcium likely will appear over time since many processed gluten-free foods and grain products lack the enrichment of these vital nutrients. Gluten-free diets also tend to be lower in fiber. Following is a discussion on some of the nutrients many children with celiac disease are deficient in and the foods they can eat to boost intake. • Iron: Approximately one-half of newly diagnosed celiac patients have iron-deficiency anemia. Children especially need iron during periods of rapid growth, such as the toddler and teen years, so it’s important for them to meet daily requirements. The most absorbable forms of iron are found in animal products, such as organ meats, beef, poultry, and fish, but there also are vegetarian sources, including beans, quinoa, and nuts. Pairing iron-rich foods with those high in vitamin C, such as citrus fruits, peppers, or tomatoes, will help maximize iron absorption. • Calcium: As mentioned, calcium is poorly absorbed in individuals with untreated celiac disease, and lactose intolerance is common because lactase enzymes are produced in the brush border of the small intestine, which can take many months to heal. Because calcium is a vital nutrient for bone development, deficiencies can lead to frequent fractures in children. Fortunately, bone mass can be rebuilt in most children who follow a strict gluten-free diet as long as they eat foods high in calcium. Hard cheeses and strained yogurt are naturally low in lactose and good sources of calcium. There are many brands of lactose-free dairy products, such as lactose-free milk and yogurt, available. Dietitians also can recommend nondairy calcium sources, such as calcium-fortified rice milk and soy milk, as well as juices, sardines, salmon, firm tofu, green leafy vegetables, and almonds. • B vitamins: Since the 1940s, breads, pastas, and cereals have been enriched with a range of B vitamins to prevent deficiencies. However, it isn’t mandatory to enrich gluten-free products with B vitamins because they’re considered specialty foods. Some mainstream gluten-free products, such as Chex cereals, are enriched with these vitamins, but most aren’t. Rather than having parents rely on processed gluten-free foods for their kids, suggest they eat a range of gluten-free whole grains and pseudograins, such as brown rice, wild rice, certified gluten-free oats, teff, sorghum, quinoa, amaranth, and buckwheat. Beans, nutritional yeast, certain vegetables, and meats also contain B vitamins. RDs also can recommend children take a gluten-free multivitamin/mineral supplement and suggest additional supplementation if needed. Because a damaged small intestine may not absorb vital nutrients, children with celiac disease may be malnourished and underweight. Generally, underweight children will gain weight fairly quickly in the first six months after starting a gluten-free diet. RDs can encourage healthful weight gain by recommending additional snacks and foods containing healthful fats. However, stressing that they follow a balanced diet is key. A study of Italian children with celiac disease showed that the rate of overweight children went from 11% to 21% after they began following a gluten-free diet for one year.3 Few studies have examined the quality of children’s diets, but a study of adults showed that 55% of snacks consumed were commercially prepared chips or gluten-free baked goods.4 This reinforces the need for dietitians to recommend the many healthful gluten-free foods available. Between the foods offered at lunchtime and the holiday parties, school can be a daunting place for children with celiac disease. Parents have the option of preparing lunch for their kids at home each day to ensure they don’t eat anything containing gluten or they can work informally with teachers or formally with school administrators to ensure a safe environment for their children. In the US public school system, if a diet is considered medically necessary, a child may be eligible for a 504 plan, a specific formal agreement made between parents and the school administration to ensure reasonable accommodations are made for children with disabilities. In addition to celiac disease, the agreement often includes providing special meals and accommodations for children who have food allergies or type 1 diabetes. “A 504 plan includes both school meals and everything outside of the lunchroom—cupcakes, art class, and more,” says Andrea Levario, JD, executive director of the American Celiac Disease Alliance (ACDA). “There’s accountability on a federal level to ensure that schools follow through.” The ACDA provides sample gluten-free meal plans that meet USDA requirements from schools around the country. A 2008 survey conducted by the ACDA showed that parents had a significant lack of faith in the cafeteria staff at their children’s schools, but Levario emphasizes this isn’t warranted. “The school is probably the safest place because of the allergy training that staff undergo. They’re going to make every effort to avoid cross-contamination, and they aren’t getting the credit they deserve,” she says. If clients are interested in pursuing a 504 plan, encourage them to obtain a note from their child’s physician explaining the medical reasons for a gluten-free diet and specifying what the meals should include. For example, the letter may state that the school should provide gluten-free bread for sandwiches. Some parents will prefer to prepare lunch at home for their children instead of relying on what’s served at school. 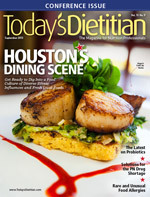 Dietitians can suggest the following lunch ideas: a chef salad with gluten-free dressing and pretzel sticks from Mary’s Gone Crackers; a ham and cheese rollup on a corn tortilla and vegetable soup; GoPicnic meals that include hummus, tuna, and gluten-free crackers as well as baby carrots; peanut butter and jelly on rice cakes and an apple; a loaded bean burrito with lettuce, tomatoes, and avocado on a corn tortilla (or a naked burrito on brown rice) with a fruit cup; or deviled eggs, raw vegetables with hummus, and a pudding cup. For snacks, parents can pack vegetables and hummus, fruit, yogurt, cheese sticks, nuts, pumpkin or sunflower seeds, homemade trail mix, popcorn, hard-boiled eggs, pudding or gelatin cups, meringue cookies, and snack bars from LARABAR, Pure Bar, or KIND Bar. For special occasions, parents can pack naturally gluten-free sweets such as M&Ms, Skittles, Snickers, potato chips, and fruit rollups. Most cookies, pretzels, and other snack foods have gluten-free varieties. Encourage parents of younger children to ask teachers to keep extra shelf-stable gluten-free treats at school in case of unexpected celebrations. And remind parents to read the labels on all the products they purchase to ensure they’re gluten free. Mention that since refrigeration often isn’t available for kids in school, parents can store lunches in a cooler bag with an ice pack or a frozen water bottle to keep food at a safe temperature. Even though children with celiac disease are more likely to have nutrient deficiencies, RDs can sit with parents and carefully plan meals that are nutritious and will help children reach a healthful weight and nutritional status. Since children spend most of their day at school, many schools now are providing gluten-free foods and meals to accommodate them. Parents can work with the administration to better meet their children’s needs or choose to pack a nutritious lunch to ensure their children avoid gluten. Throughout this journey, RDs can offer parents resources and strategies to help make it a smoother one. — Cheryl Harris, MPH, RD, has a private practice in Alexandria and Fairfax, Virginia. She’s a nutrition advisor for the DC Metro Area Celiac Support Group and speaks locally and nationally about celiac disease. Suggest the following books to parents with children who have celiac disease. These resources can help parents educate their children about the condition and help them accept their diagnosis and new way of life. There are several national support groups with local chapters that address the needs of children with celiac disease. The groups help children connect with one another to avoid feeling alone, and they give parents the support they need. 1. Rubio-Tapia A, Kyle RA, Kaplan EL et al. Increased prevalence and mortality in undiagnosed celiac disease. Gastroenterology. 2009;137(1):88-93. 3. Valletta E, Fornaro M, Cipolli M, Conte S, Bissolo F, Danchielli C. Celiac disease and obesity: need for nutritional follow-up after diagnosis. Eur J Clin Nutr. 2010(11);64:1371-1372. 4. Lee AR, Ng DL, Dave E, Ciaccio EJ, Green PH. The effect of substituting alternative grains in the diet on the nutritional profile of the gluten-free diet. J Hum Nutr Diet. 2009; 22(4):359-363.